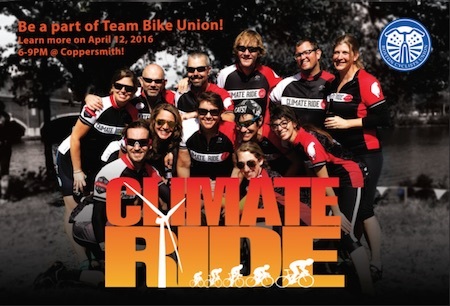 Join Team Bike Union on Climate Ride! 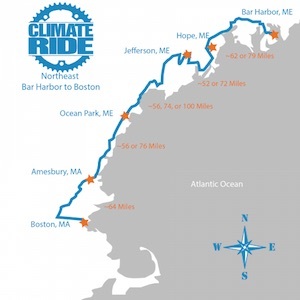 This year Climate Ride will be doing two great rides on the east coast, Bar Harbor to Boston (Sept. 8th -12th) and NYC to DC (Sept 17th - 21st). 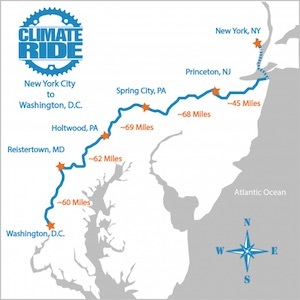 Climate Ride is a multi-day, supported bike ride where participants raise money for bike advocacy and environmental causes. A number of people have already signed up to join Team Bike Union's Northeast Ride and NYC-DC ride to help support our work, and you can too! If you're interested in finding out more, join us at Coppersmith on Tues. April 12th from 6 to 9 pm to meet the current team members, past riders, learn more about the ride, and sign up! There will also be a special appearance by Climate Ride staff! Last year Team Bike Union raised almost $36,000 on just one ride!